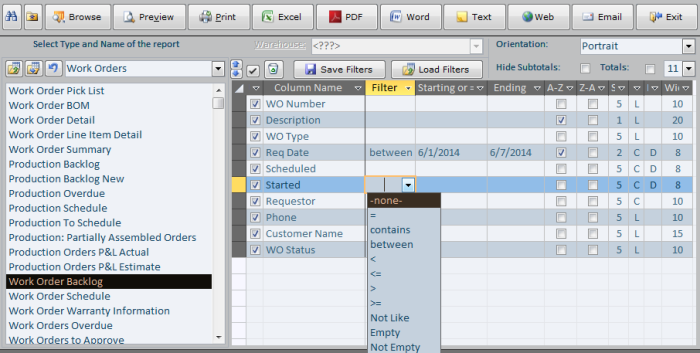 The All Reports screen allows you to quickly find, configure, and run most system reports. Binocular. To find you report, click the Binocular button and type in a few characters that contained in the report name. All reports will be filtered by your input and appear in the list on the left. Favorites. To add current report to your favorites, click the Favorites button. To access your favorites, select Favorites in the Report Type list. The next buttons are Screen Browse, Screen Print Preview, Send to Printer, Send to Excel, Create PDF, Send to Word, Send to a text file, create HTML page, Send in email as PDF attachment. The right-top section below the Exit button allows selection of the report orientation, paper size, hiding subtotals and totals, and changing the report font size. The later is useful when you have to print or view lots of information, but it does not fit well on paper or screen. The mid section buttons will clear all filters, save filters, load previously save filters. The clear is global, but the save and load are user-sensitive. The section in the right-bottom corner allows you to filter reports. For any column select a filter and a value in the Starting column. If you select the Between filter, provide the ending value in the Ending column. For all other filters the Ending column is ignored. The A-Z and Z-A columns specify the report sorting. If you choose more than one sorting column, provide the sort priority in the column to the right of Z-A. By default, all priorities are set to 5. If you need to move sorting of a column to the top, set the priority to any lower number from 1 to 4. The next column controls justification: L – left, C – Center, R – Right. And the last column controls relative field width. We hope, you enjoy using this screen and appreciate the effort put into it.